A STORY of evil; of satanism and devil worship . . . A story that chills the heart even as it fascinates the eye . . . A story to evoke loathing and contempt . . . The sombre tale begins somewhere in Italy in the Middle Ages. Prince Prospero (Vincent Price), the tyrannical ruler of the province, is a worshipper of Satan and as such he is utterly without compassion or mercy. The lot of the peasantry living in the shadow of his grim castle is miserable indeed, and when the prince notices them at all it is merely to taunt them or practice some further infamy upon them. Having claimed most of the harvest for himself, Prospero invites the peasants to come and eat the scraps at an end-of-harvest feast which he is giving to his nobleman friends. There are, however, mutterings of rebellion and these are voiced by Gino (David Weston) and Ludovico (Nigel Green) who have the courage to face prospero. 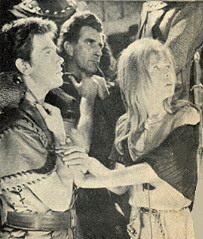 Enraged, he orders their immediate strangulation, but Francesca (Jane Asher) bravely steps forward to plead for their lives. Prospero now displays his sardonic humour. One of them only need die, he says, and Francesca shall decide which. This is a cruel dilemma to force upon the girl, for Ludovico is her father and Gino the man she loves. The moment of decision is delayed when Prospero is confronted with evidence of the horrible Red Death which is ravaging the country and has now reached the village. The Prince only stays long enough to order the entire village to be burnt to the ground before returning to his castle, taking with him the two prisoners and francesca. The men are thrown into dungeons, but Prospero has different ideas for Francesca. To is taken to a gorgeous bathroom, forcibly stripped and bathed; her hair beautifully dressed,; and she is given sumptuous clothes and fabulous jewels. 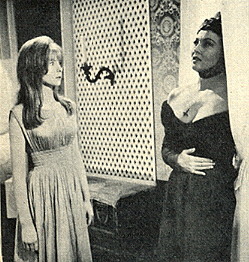 Set the task of instructing Francesca in the ways of the court is Juliana (Hazel Court), the companion of Prospero and, like him, a dedcated worshipper of Satan. Gino and Ludovico are brought before the assembled guests to provide amusement. Prospero orders each to cut himself with a number of daggers, one of which is poisoned . . .
Juliana, in an ecstacy of evil, gives herself completely to the Devil and burns the Mark of Satan upon her breast . . .
Francesca, disturbed in the night, finds herself rushing through corridors and dungeons where she encounters much to terrify her . . . But there is a grim surprise for the evil Prospero in the shape of an uninvited guest at his Masque Ball - a Man in Red. The Ball becomes a terrible Dance of Death . . . The Masque Of The Red Death is the sixth in the Edgar Allen Poe series directed by American Roger Corman, and it will probably be acclaimed as his best. The sets are superb and the great banqueting hall, the hideous dungeons, the two miles of corridors, the Satan chapel, and many other rooms in the castle have the shocking authenticity of the frightful cult of Satanism. Colour highlights the all-pervading air of evil. Vincent Price is a magnificent Prince Prospero, epitomising the unregenerate worshipper of Satan. Hazel Court gives an eerie portrayal of the female of the same species, while Jane Asher - friend of Paul McCartney of The Beatles - confirms her earlier promise. Another good performance from Nigel Green who distinguished himself as the Colour-Sergeant in Zulu.